736 pages | 40 B/W Illus. Big Data in Omics and Imaging: Integrated Analysis and Causal Inference addresses the recent development of integrated genomic, epigenomic and imaging data analysis and causal inference in big data era. Despite significant progress in dissecting the genetic architecture of complex diseases by genome-wide association studies (GWAS), genome-wide expression studies (GWES), and epigenome-wide association studies (EWAS), the overall contribution of the new identified genetic variants is small and a large fraction of genetic variants is still hidden. Understanding the etiology and causal chain of mechanism underlying complex diseases remains elusive. It is time to bring big data, machine learning and causal revolution to developing a new generation of genetic analysis for shifting the current paradigm of genetic analysis from shallow association analysis to deep causal inference and from genetic analysis alone to integrated omics and imaging data analysis for unraveling the mechanism of complex diseases. 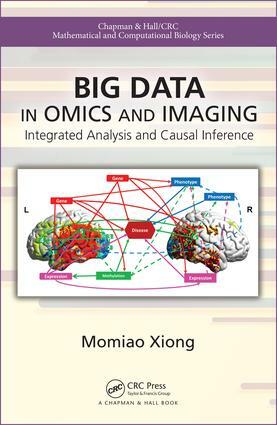 Provides a natural extension and companion volume to Big Data in Omic and Imaging: Association Analysis, but can be read independently. Develop novel statistics for genome-wide causation studies and epigenome-wide causation studies. The book is designed for graduate students and researchers in genomics, epigenomics, medical image, bioinformatics, and data science. Topics covered are: mathematical formulation of causal inference, information geometry for causal inference, topology group and Haar measure, additive noise models, distance correlation, multivariate causal inference and causal networks, dynamic causal networks, multivariate and functional structural equation models, mixed structural equation models, causal inference with confounders, integer programming, deep learning and differential equations for wearable computing, genetic analysis of function-valued traits, RNA-seq data analysis, causal networks for genetic methylation analysis, gene expression and methylation deconvolution, cell –specific causal networks, deep learning for image segmentation and image analysis, imaging and genomic data analysis, integrated multilevel causal genomic, epigenomic and imaging data analysis. Sparse Functional Structural Equation Models for phenotype and genotype networks. Conditional Gaussian Graphical Models (CGGMs) for Structural Imaging and Genomic Data Analysis. Momiao Xiong is a professor of Biostatistics at the University of Texas Health Science Center in Houston where he has worked since 1997. He received his PhD in 1993 from the University of Georgia.